Power Grid Corporation of India Limited (PGCIL) has released notification for the recruitment of 39 Diploma Trainee (Electrical, Civil) Junior Officer Trainee (HR), Assistant Finance, Junior Technician Trainee (Electrical) posts. All the candidates who are looking for the government jobs can apply for these posts. The candidates who are interested can check the eligibility criteria, age limit and other details from the below article and apply for these posts on or before 6th September 2015. Aspirants can apply online from the official website powergridindia.com or the link provided below. POWERGRID, the Central Transmission Utility (CTU) of India and a Navratna Public Sector Enterprise under the Ministry of Power, Govt. of India is engaged in power transmission business with the mandate for planning, co-ordination, supervision and control over complete inter-State transmission system and operation of National & Regional Power Grids. Around 1,17,323 circuit kilometers in under the ambit of Power Grid and is spread around 196 substation and wheels at about 55% of total power generated in the country through its transmission network. It releases the notification and conducts the examination to recruit the eligible candidates. This year it has released the notification for 39 various posts. All the interested candidates can apply for the recruitment examination on or before 6th September 2015 from the official website powergridindia.com or from the link provided below. Read below article for more information. Diploma in Civil Engineering from recognized Technical Board/ Institute, with minimum 70% marks for General and Pass marks for ST/PwD. Two years (Full time Course) Post Graduate Degree/ Post Graduate Diploma/ MBA in Human Resource/ Personnel Management / Industrial Relation/ MSW or equivalent from recognized Institute with not less than 55% marks for General and Pass marks for SC/ST/PwD. B. Com with first (1st) division for General /OBC (NCL) and Pass marks for PwD. Additional Qualification of M. Com shall be desirable. Candidate should have One year Post qualification experience in Finance and Accounts function of an organization of repute. should have experience in processing payment and maintenance of Accounts of the organization. should have worked on Computers and familiar with various software used in Finance and Accounting function. Candidates upper age should be 28 years for Assistant, 27 years for remaining all posts as on 06-09-2015. Age relaxation is applicable 3 years for OBC, 5 years for SC/ ST, 10 years for PwD candidates as per rules. Candidates have to pay Rs. 300/- (No fee for SC/ ST/ PwD/ Ex-SM/ Departmental candidates) through Internet banking/ Debit Card (Visa or Masters)/ Credit Card (Visa or Masters)/ Bank Challan. Selection of the candidates would take place thorough taking written test, personal interview and computer skill test of the candidates by the concerned recruitment authority. Candidates would be evaluated on the basis of all the three grounds. 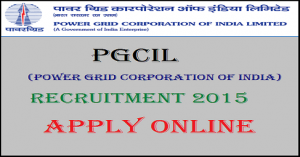 How to Apply for PGCIL Recruitment 2015 ? Candidates should logon to the official website powergridindia.com or the link provided below. 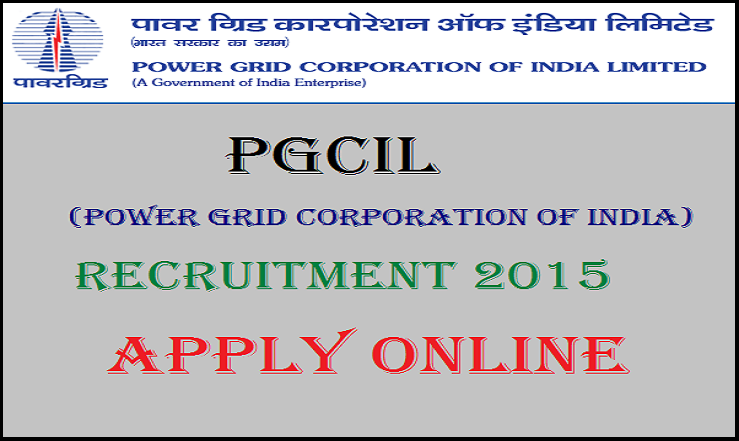 Click on PGCIL Recruitment 2015. Fill all the details correctly and pay the application fee online. Candidates should upload scanned photograph and signature.